Victor Lisboa at minhadistopia has put together a Portuguese version of my comic book adaptation of Poe’s “Annabel Lee” : http://www.minhadistopia.com/annabel-lee-em-quadrinhos/ The translation is by Fernando Pessoa, and I must say it is almost as beautiful as the original. I think there is something in the sibilant and slightly muffled tones of Portuguese, at least in the hands of a master like Pessoa, that is particularly well-suited to capturing the poem’s atmosphere of wind and sea. 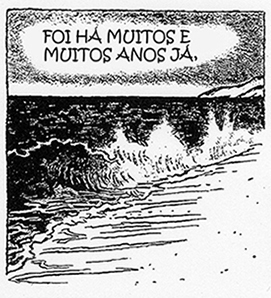 This entry was posted in Annabel Lee, comic book poetry, Edgar Allan Poe, Poetry translation and tagged Fernando Pessoa, minhadistopia, Portuguese translation, quadrinhos, Victor Lisboa. Bookmark the permalink. nonintrusive way, because your artwork in Annabel Lee reflects admirably the dark intensity from Poe’s verses. Thank you to you, Victor, for your sensitive adaptation, and for introducing me to Pessoa’s beautiful translation.